This will be a meetup we are organizing with Tartu University to bring together scientists & entrepreneurs. 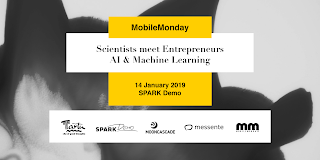 We'll cover a very popular topic - namely Artificial Intelligence (AI) and Machine Learning (ML) on 14th of January 2019 at 17:30 at Spark Demo. to facilitate new connections and personal relationships between scientists and entrepreneurs but also interdisciplinary connections inside these two communities - between the people in academia itself and in the industry itself. to give an overview of what's going on in a certain field of scientific research - what's the state of research, what's happening today, how does the bleeding edge of research look like. to give an understanding where are the results of this scientific research applied and to give you some sense of future vision where could this research lead in the future. to make it into an event series - so after AI we'd choose the next topic in 1-2mo time (in Tallinn to bind together the scientists and entrepreneurs all over Estonia). As a scientist, you would meet people from industry and other scientific fields. You would get insights what are the needs of industry today and where's the research headed in other fields. You would also get valuable contacts and insights how to pursue an entrepreneurial path in the future, if you choose so. As an entrepreneur or industry professional, you'd meet people from other industries and academia. You'd widen your horizon on the matters of scientific research and you might find ideas how to be more competitive with your company in the long-run. 17:30 - Doors open & registration. 18:15 - Mark Fishel Head of NLP, Institute of Computer Science, University of Tartu, ex-Postdoc Researcher @University of Zurich, Switzerland on "Natural organic non-gmo bio-degradable eco-friendly Language Processing"
18:35 - Dima Fishman PhD Sudent @ University of Tartu "Challenges for Artificial Intelligence in Medicine"
19:15 - Tambet Matiisen - PhD student @ Computational Neuroscience Lab at the University of Tartu on "Software is eating the world. AI is going to eat Software." 19:35 - Peeter Piksarv - Data Scientist @Mooncascade, ex-Postdoc Researcher @University of St Andrews, Scotland on "What kind of scientific skills have I been using in my industry projects"
19:55 - Kristjan Korjus - Head of Data @ Starship Technologies "Data SCIENCE in the industry"